Carlo Miranda's parents were Elena Nimmo and Giovanni Miranda, a physician and professor at the University of Naples where he served as rector during the years 1921-22 when his son Carlo was growing up. Carlo attended school in Naples, completing his secondary education at the age of fifteen. Entering the University of Naples in 1927, he studied mathematics with Mauro Picone and graduated on 16 July 1931 at the age of eighteen. His thesis, on singular integral equations of the first and second kind with non-symmetric kernel, and the related question of the integral representation of a square integrable function, was inspired by the research of Tage Gills Torsten Carleman. Miranda had not just been influenced by Picone while he studied at Naples, but he had also learnt much from Picone's assistant Renato Caccioppoli and from Caccioppoli's thesis advisor Ernesto Pascal. Picone, a vivacious, bright and aggressive Sicilian had been the first mathematician in Italy to recognize the importance of numerical analysis ... the pure mathematicians at the University of Rome despised the subject, although the Germans had already given it high status in some of their universities. With admirable single mindedness and great political skill Picone succeeded in getting appointed to a chair of mathematical analysis in Rome, left Naples University together with his brilliant assistant Miranda and, besides teaching the kind of mathematics acceptable to his illustrious colleagues, obtained a small grant from the newly established Italian National Research Council to start in a small apartment in Rome in a new section of town the high-sounding "Institute for the Applications of the Calculus." Miranda continued to work as part of the National Institute for the Applications of the Calculus (INAC) in Rome. He visited Paris in the academic year 1934-35, supported by a scholarship, and attended lectures by Jacques Hadamard and Paul Montel. During this time in Paris he became friendly with several mathematicians, including Jean Leray and Hans Lewy. Miranda returned to Rome for the academic year 1935-36 when he was put in charge of teaching the theory of functions at the University of Rome. He continued in this role in 1936-37 but, during 1937, he won the competition for the chair of Algebra and Infinitesimal Calculus at the University of Genoa. He took up this chair towards the end of 1937, and the course he taught there in 1937-38 became the book Lezioni di analisi algebrica Ⓣ. He left Genoa in 1939 when he was appointed to the Turin Polytechnic. Examples of his work around this time are: Su un problema di Minkowski Ⓣ (1939) which considers the problem of determining a convex surface of given Gaussian curvature; Su alcuni sviluppi in serie procedenti per funzioni non necessariamente ortogonali Ⓣ (1939) which examines expansion theorems in terms of the characteristic solutions of an integral equation whose kernel, although symmetric, involves the characteristic parameter; Nuovi contributi alla teoria delle equazioni integrali lineari con nucleo dipendente dal parametro Ⓣ (1940) which examines the development of the Hilbert-Schmidt theory for a particular type of linear integral equation; and Observations on a theorem of Brouwer (1940) which gave an elementary proof of the equivalence of Brouwer's fixed point theorem and a special case of Kronecker's index theorem. In September 1939 World War II began with the German invasion of Poland. Italy did not enter the war at this point and only in June 1940 did Italy declare war on Britain and France. However, days later France fell and so only in October 1940 did the war take shape for Italy when they attacked Greece. Miranda was teaching in Italy and the right age to be drafted into the army but he managed to avoid being called up. This was largely due to the efforts of Picone who made Miranda a consultant for the National Institute for the Applications of the Calculus (INAC) and argued that the Institute was vital for military research and therefore its staff (including consultants such as Miranda) must remain in post and not be drafted into the army. Picone was a member of the Fascist party and had made a strong argument that the INAC was undertaking "Fascist mathematics". He had indicated in a report in 1938 that the Institute was undertaking important theoretical work, and here he emphasised Miranda's work on the calculus of variations and eigenvalue problems. The report also listed the military work commissioned by the Ministry of National Defence. Miranda continued to work at the Turin Polytechnic where he was promoted to full professor in 1941. He requested a transfer to the University of Naples where he moved at the beginning of the academic year 1943-44. At the beginning of the academic year 1944-45 he moved to the chair of Algebraic and Infinitesimal Analysis. The war had gone badly for Italy and Mussolini was deposed in July 1943. This was largely due to Pietro Badoglio who became prime minister, and arranged an unconditional surrender to the Allies in September 1943. The Fascist party was dissolved and Italy declared war on Germany in October. However, German armies defended Italy against the Allied advance from the south. In October the Allies entered Naples but their advance was stopped at this point. During the occupation of Naples by the allied troops, the buildings of the Faculty of Mathematics, Physics and Natural Sciences, located in the Via Mezzocannone, were requisitioned and used by the U.S. Army Military Police. They continued to occupy the buildings until Rome fell to the Allies in June 1944. It was impossible to move around Italy during these years of violent conflict and half of the mathematicians employed at the University of Naples were unable to reach the city. Only two mathematicians, Miranda and Caccioppoli together with the astronomer Vittorio Nobile, were teaching there at this time, with one further mathematician, G Andreoli, suspended by the Allies because of his uncompromising adherence to fascism. With World War II finally over, it was left to Miranda and Caccioppoli to rebuild mathematics at the University of Naples. However, Caccioppoli had no practical or organisational skills so it was left to Miranda, in his early thirties, to revive mathematics at the University of Naples on his own. He was offered little help and had few resources, but he had a clear vision of how he wanted to develop mathematics based on an Institute of Mathematics with single well stocked library. The Institute began to operate from 1944, with Miranda as its director. He held this role until 1963 and was personally responsible for many years for the remarkable growth of the library. This, however, was not easily achieved for although many books had survived the war, they were randomly piled up and the old library catalogues had been destroyed. The teaching load during the post-war years was particularly heavy for Miranda, since he restarted a full lecture programme with only Caccioppoli to assist with lectures and a few assistants in charge of exercise classes. However, between Miranda and Caccioppoli there was a profound scientific and human bond - they complemented each other perfectly due to their different character traits; both were brilliant but Caccioppoli was totally disorganised while Miranda was a superb organiser. Guido Stampacchia had been a student at Pisa when, due to the war, he had to undertake military service. He was able to return to his home town of Naples after the Allies took control of the city in October 1943. However, the Liberation Army then put him to work on administrative duties and he was not discharged from his military duties until June 1945. He was able to take advantage of a special dispensation which allowed students to complete their degrees so he studied at Naples taught by Miranda and Caccioppoli. A scholarship enabled him to continue his research at the University of Naples under the supervision of Caccioppoli and Miranda, and he also undertook tutorial work to assist the Professor of Algebraic Analysis, although this was done on a voluntary basis. Stampacchia felt that contact with Caccioppoli and Miranda was important for him and Leonida Tonelli advised him to take a position as an assistant at the Naval Institute at Naples. In addition to teaching at the Naval Institute he taught at the University on a voluntary basis and was able to add to both the teaching there and to the vigorous research team which Miranda had begun to build at the Institute. Miranda had married Ersilia Sterlacci and they lived in Naples at 31 Via F Crispi; they had one daughter Elena. Several of these contributions are treated with some detail: results concerning normal families and approximation theory, the equivalence between Brouwer's fixed point theorem and a result for the zeroes of some systems of continuous functions, the Cauchy-Dirichlet problem for the propagation equation, the numerical integration of the Thomas-Fermi equation, integral equations (introducing the notions of pseudofunction and singular eigenvalue), problems of differential geometry "in the large", etc. His work on partial differential equations, especially on first order linear systems in dimension greater than 2 (where conformal mapping cannot be used), is very interesting, and the same thing can be said about the integration of exterior differential forms of any degree (establishing for the first time in 1953 the algebraic-topological nature of the index for some elliptic problems). The proof of the maximum modulus principle for elliptic equations of order 2m is also remarkable. We point out his very special interest in two of the main tools of the "modern" theory of partial differential equations, namely a priori estimates and the application of functional analysis. Some attention is paid to his important book on partial differential equations. This monograph is essentially a complete and thorough review of various methods that have been introduced in the mathematical literature to prove existence theorems for problems concerning second order partial differential equations of elliptic type, both linear and nonlinear. With powerful synthesis and truly wonderful discerning exposition, the author succeeds in this goal by providing students of partial differential equations with a work of fundamental importance. Earlier than this, in 1949, Miranda had published his lecture notes for the academic year 1948-49 on Problemi di esistenza in analisi funzionale Ⓣ. This was reissued in 1975. He published another set of lectures under the title Su alcuni problemi di geometria differenziale in grande per gli ovaloid Ⓣ in 1973. These lectures had been given in 1971-72. Although Miranda was assisted by Caccioppoli in building a school of mathematics in Naples for over ten years, this tragically ended in 1959 with Caccioppoli's suicide. Miranda was, by this time, Dean of the Faculty of Sciences at Naples, a role he held for ten years from 1958. 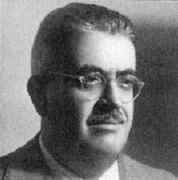 Also in 1958 he had become vice-president of the Unione Matematica Italiana (Italian Mathematical Union), holding this position until 1964. He founded the journal Ricerche di Matematica in 1952 and, with Caccioppoli, relaunched the Giornale matematiche di Battaglini. He served on the editorial board of the Annali di matematica pura ed applicata (Milan) and the Memorie di matematica, which is a journal published by the National Academy of Sciences of Italy (the Academy of Forty). Miranda was honoured with election to the Accademia dei Lincei in 1968. This academy had already awarded him the prestigious Presidente della Repubblica prize, in 1961. He was also elected to a number of other academies. He was awarded the Urania Prize by the City of Naples in 1954 and the Gold Medal for Science, Culture and the Arts in 1960. Following his sudden death, he was honoured by the Academy of Science Physics and Mathematics of Naples who set up an award in his name for young Italian analysts specialising in the study of elliptic equations. The mathematics library at the University of Naples is named for him, as are two high schools. An international conference on Methods of functional analysis and theory of elliptic equations was held in his honour in Naples 13-16 September 1982.